Nothing says Hanuka better than potato latkes for dinner and jam doughnuts for dessert. 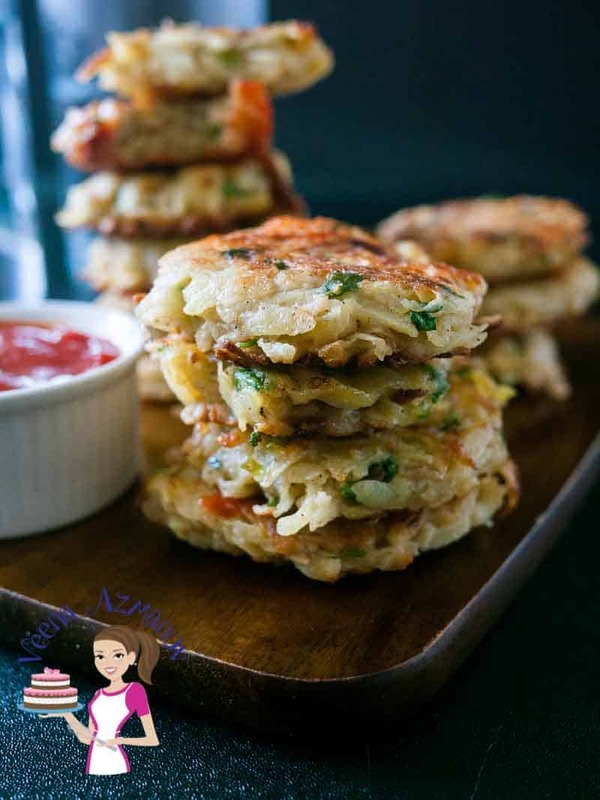 This simple, easy and effortless recipe makes the best potato pancakes; crispy on the outside, soft tender flavored potato on the inside. Seasoned with onions, garlic and fresh herbs these are truly festive. What to know the secret to how I make these perfectly every single time. Have you eaten latkes before? Or perhaps you know them like potato pancakes. I grew up eating these as potato patties. Well, different names among the same common ingredient. To make a long story short. The word ‘Latkes’ does have a special significance. In the Ashkenazi Jewish culture latkes are made at the time of the ‘Hanuka’ festival since 1800. Potato latkes are made as a celebration of the miracle of oil (called menorah in Hebrew) that lasted for eight days instead of one day. When the Syrian Greek king Antiochus captured the holy temple in Israel the Jerusalem guerrilla warriors called ‘Maccabees’ vowed never to submit. When the war was over; they lit the temple lamp (menorah) with the little oil that they found. The oil that would have otherwise lasted only one day lasted them eight days. To celebrate that miracle the Jewish people eat food fried in oil like the famous Jam Doughnuts called Sufganiyot in Hebrew and these Potato Latkes. Now, I’m not Jewish, my husband is. I’m Catholic so in our home, we celebrate both Hanuka and Christmas. We have the Christmas Tree lit up as well as light the Hanuka candles in the menorah to celebrate Hanuka. My kids listen to Christmas Carols as much as they sing Hanuka songs all day long. And they get gifts from Santa for Christmas as well as lots of Hanuka gifts and candy. The best of both worlds. As a mom, I make it a point that they get not just Indian food from my Indian background but also Jewish food from my husband’s background. Often it’s not easy because food from other cultures can be very hard to learn. Lucky for me cooking comes easy and I learn fast. This week I was very proud when my Aadi’s teacher picked me to make the latkes for the kids in class for the Hanukah celebration. The kids enjoyed it very much and Aadi came home feeling very proud. Then said – ‘hey mom, my friends were asking how come you make Israeli food so good when you come from India? A proud moment indeed. 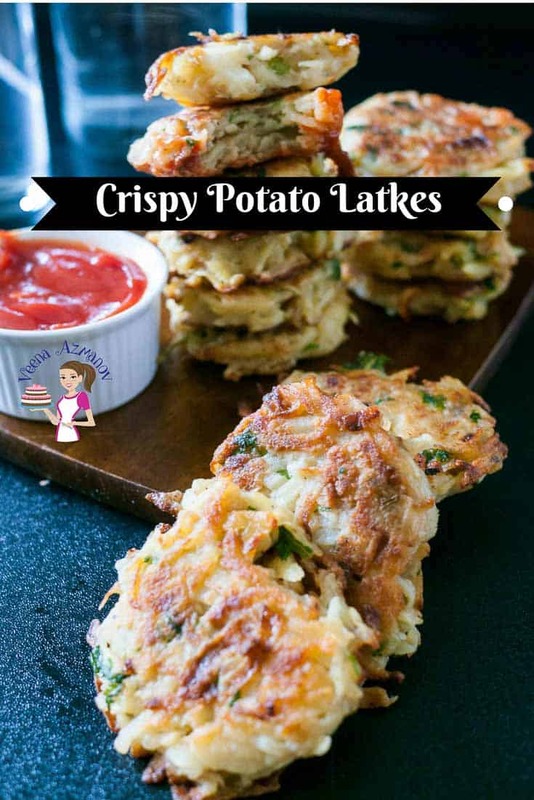 Potatoes – Honestly, the starchier the potatoes, the crispier the latkes. I love using the russet potatoes over any other. The Idaho work just as well but I find that the russet tends to give a better crisp coating on the outside. Again, you can use the other variety just as well. Onions – These are traditionally grated raw in the potatoes. Then the excess water is drained from both the onions and potatoes. I personally prefer a bite so I like to chop them finely and cook them for 3 to 5 minutes first. This takes away the raw taste, reduces the quantity and adds a nice caramelized sweetness. 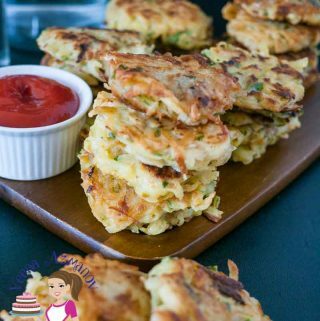 Garlic – You just want to add a hint of flavor so a small amount is all it takes to flavor these potato pancakes. 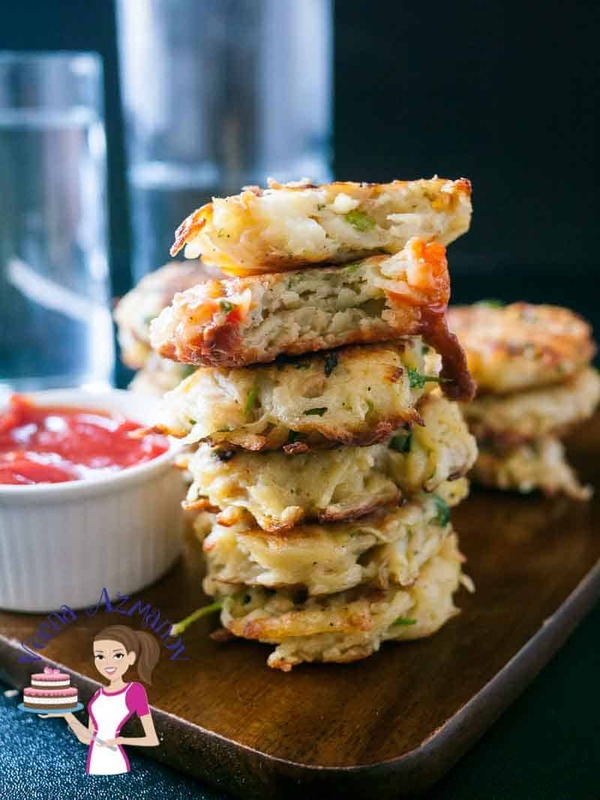 Rice flour – Traditionally matzoh meal is used to make these potato latkes and gives a nice crisp coating too. Most of us do not have matzoh meal at home so I use rice flour. You can use cornstarch or flour as well but if you want a nice crisp outside rice flour will work the best. Cilantro – I love using cilantro but parsley is often most commonly used. Canola oil – As you can see I do not deep fry my latkes. Traditionally these are fried in oil but I think a lightly oiled fry pan works just as well. You are free to shallow fry them in an about an inch of oil if you want to do them traditionally. Chop onions fine and saute with one tsp oil and a pinch of salt until translucent and reduced. Beat the egg well – set aside. Use a large fry pan (or two) and heat 2 tbsp oil on low heat. Use a colander with a bowl underneath. Alternatively, you can use the grating attachment on the food processor. The salt will help release the liquid from the potatoes. And add them to the egg mixture. Working quickly; using a 1/4 cup measure as a guide. Gently shape the mixture into a ball and into the hot pan. The high heat will cook the potatoes outside to crisp. After one minute flip the latkes before they become too brown. Add a tablespoon or more of cooking oil if needed. After a minute reduce the heat and cook gently flipping again as needed so the latkes are cooked right thru. They will take about three minutes more with a total of about 5 minutes. Remove and blot excess oil on a paper hand towel. Nothing says Hanuka better than potato latkes for dinner and jam doughnuts for dessert. 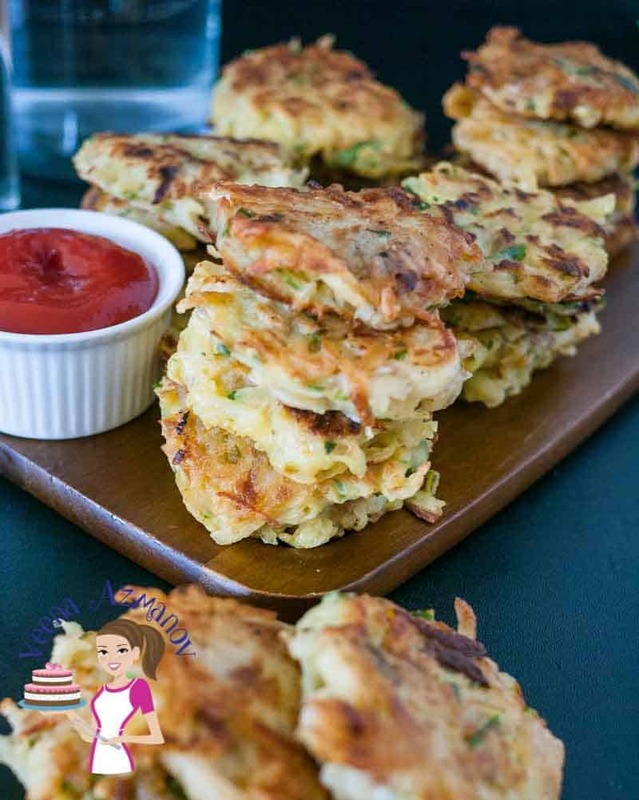 This simple, easy and effortless recipe makes the best potato pancakes; crispy on the outside soft tender flavored potato on the inside. Seasoned with onions, garlic and fresh herbs these are truly festive. Beat the egg well - set aside. Use a large fry pan or two and heat 2 tbsp oil on low heat. Add a tablespoon or more of cooking oil in needed. They will take about three minutes more taking about 5 minutes in total. Remove and blot excess oil on paper hand towel. This looks so crispy and delicious! I love the tips about which potatoes to use to make them! I’ve saved this to make later – yum! Thank you, Holly. Yes, they are crisp on the outside. 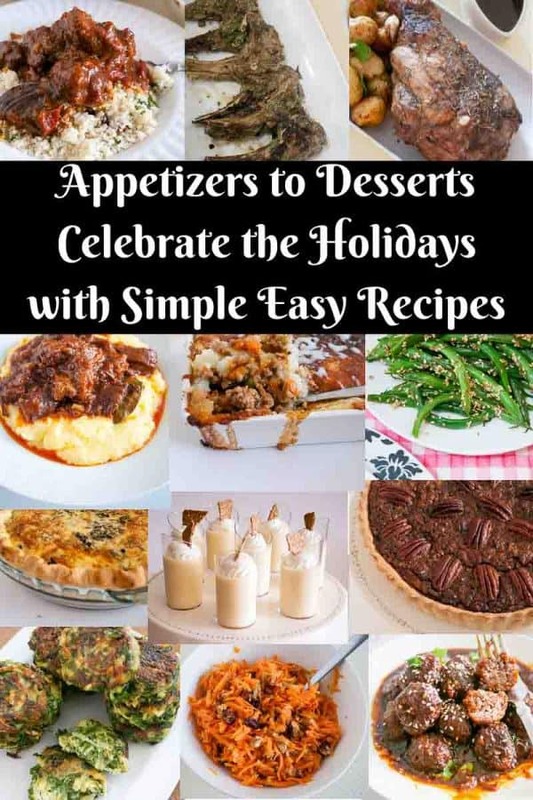 Your recipes are always so wonderful! I am excited to try these! I plan to eat them as snack as well as a side dish with dinner! Thank you so much, Amanda. So happy you enjoy my recipes. I am totally in love with the recipe. Looks so crispy and delicious. I will try this soon. I’m obsessed with potatoes and anything to do with potatoes i’m in. Those cute little pancakes looks absolutely delicious! These look so crispy and delicious. The golden brown color is perfect and not too greasy. I bet these are a welcome sight at any meal. Thank you, Lauren. I don’t deep fry them so they don’t become greasy. I love the story about the oil. Traditions are a wonderful thing — keeps the generations tied together. Now, for your latkes, I’d love to make your recipe. I’ve made potato pancakes before but they were okay — nothing to write home about. Yours look like they have lots of flavor and texture. This is on my bucket list to do. Thanks, Marisa. I hope you try these. So good. love this recipe! I was born and raised in Poland, and we have a very similar dish, which is still one of my favourite things in the whole world! Thanks, Anna. Yes, there is a polish version of this recipe too. My mother-in-law was polish and she made it often for us. 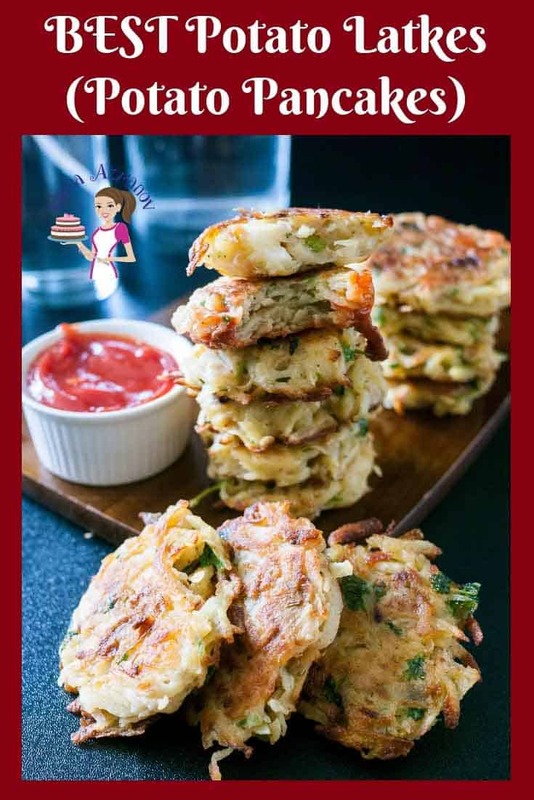 This is such a lovely post Veena, I love that your kids get to celebrate both cultures, I bet they have such a great time x These latkes sound amazing, I can’t wait to try them! Thank you, Michelle. They do have a great time. These look delicious, my kids are going to love them! I have never tried making these, but I’ve always wanted to. Time to give it a try! This would be a win in any home! Can’t wait to try latkes! They look amazing! Thanks, Kelly. I hope you try. The history of these is fascinating! I can’t wait to give this recipe a try, it’s like nothing I’ve ever made before! Thank you, Amy. yes, history and food is always a great read. This is one of my childhood comfort foods! Mine too Arlene. I make it all year round. I haven’t made latkes in forever. I love this version with all the flavor packed in – yum! Definitely lots of falvor packed in this one Michelle. where do you find russet potatoes in Israel? I live in Jerusalem and I have never found them in my city! I do miss the russets having grown up in the US. I know what you mean Rochelle. I rarely find them at my grocer here but quite expensive. I too miss them so when he brings them I pick a few. He does bring some nice berries and seasonal fruits but they are always so expensive..
We love potatoes!! And made this way would make them totally irresistible. It is so nice adhering to traditions and it sounds like you take the best of both worlds. I can’t wait to make this recipe — I’m making seafood and I wanted the menu to have some pizzazz. It’s an addiction in our house Marisa. And we make in plenty this time of the year. Like you said best of both worlds. Aw that’s so nice to hear your son being proud of you! I too am Catholic and my stepdaughter and grandkids are Jewish so I’m learning about all their foods and customs. They too celebrate both holidays. I’ll have to pass this recipe on to her. Or maybe I’ll make them when they come to visit! Thanks Denise. It’s always a nice feeling when your kids feel proud and learn to appreciate you. Happy to hear you can make this for your family. OMG I am such a potato lover, and yet I have NEVER made these. I will be giving this recipe a try very soon….it would be the perfect side to so many great dishes. THANKS!! Absolutely Gloria. Makes a great side for so many dishes. Hope you try it. We love latkes. I didn’t realize there was such a rich history around a humble dish! So interesting. We cannot wait to try making this at home. It looks so delicious. Thank you Jolina. I had been eating this all my life at home as well but only when I got married realized the significance of it.